A newly-launched Russian radio telescope successfully unfurled a 10-meter dish-shaped reflector this weekend, overcoming one of the biggest risks on the observatory's ambitious mission to see inside black holes and view other cosmic phenomena. The Spektr-R spacecraft launched July 18 aboard a Zenit rocket with a Fregat upper stage, which released the 8,000-pound satellite in an orbit stretching to nearly the distance of the moon. Its sensitive telescope will listen for faint radio signals from black holes, collapsed stars, stellar nurseries and other objects. The satellite's 33-foot dish locked itself in the open position early Saturday after trouble latching the reflector during initial deployment attempts Friday, according to reports from Russia. The reflector is made of 27 carbon fiber petals that were supposed to take about two hours to deploy. 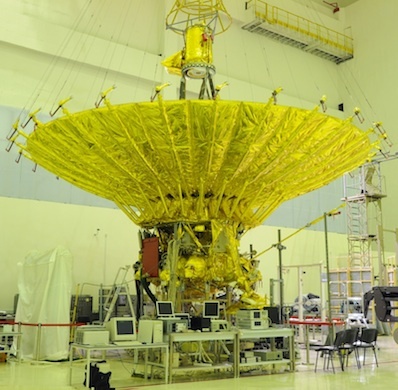 "It is difficult to express how happy we are to report that the space radio telescope on board the Spektr-R spacecraft was successfully unfolded today," Russian scientists reported in an online newsletter. "This is an extremely important milestone for the mission and a significant achievement which resulted from [the] hard work of hundreds of people in Russia during many years." The Spektr-R satellite is one element of an international network of observatories in a project called RadioAstron. When linked with ground-based telescopes across the globe, Spektr-R will facilitate unprecedented views into black holes that form the centers of galaxies. The combination of ground and space telescopes is called interferometry, creating an artifical observatory comparable to a single dish larger than Earth. The broad size of the combined instrument means it can collect extremely faint radio signals unheard by any other sensor. The RadioAstron project's exceptional sensitivity could allow the connected telescopes to peer into black holes and resolve the event horizon, the point at which nothing -- not even light -- can escape a black hole's immense gravitational grasp. When tied together, RadioAstron's telescopes have a resolution of 7 microarcseconds. That's thousands of times better than the Hubble Space Telescope, which has a peak resolution between 0.05 and 0.1 arcseconds. An arcsecond is swath of the sky measuring less than three one-thousandths of a degree. But Hubble observes the universe in visible, ultraviolet and near-infrared light, while the RadioAstron mission will unveil the unseen cosmos emitting radio waves. One of the primary targets the RadioAstron team plans to study is M87, a nearby galaxy that features a jet of matter emanating from a supermassive black hole at its center. It is also a well-known source of radio waves. The M87 galaxy is the best opportunity for RadioAstron researchers to image the event horizon, which is large enough to swallow the entire solar system. Astronomers estimate M87's central black hole is 6.6 billion times as massive as the sun. The Astro Space Center is coordinating the Spektr-R mission. 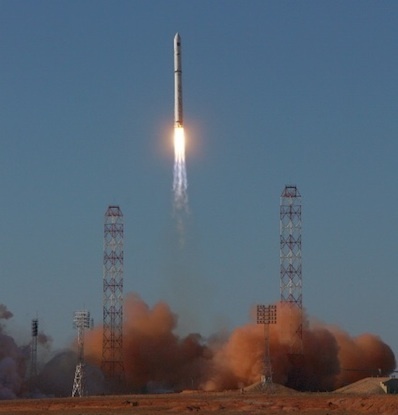 The spacecraft was manufactured by NPO Lavochkin, a leading Russian satellite developer. Other scientific studies for the RadioAstron mission include pulsars -- the fast-spinning collapsed remnants of dead stars -- dark energy's role in the expansion of the universe, star formation, and interstellar plasma, according to the Astro Space Center. Before Spektr-R, radio telescope interferometers were limited much smaller sizes. But the Russian-led satellite mission was deployed in an orbit taking it nearly to the moon, adding a new observatory to the chain of ground-based facilities and expanding their collecting area into space. The first "fringe search" science campaign involving Spektr-R is planned later this year once the satellite finishes testing in orbit. The 1,000-foot-diameter Arecibo observatory in Puerto Rico will join the search, along with the smaller Green Bank Telescope in West Virginia, a 330-foot-wide dish in Effelsberg, Germany, and up to a half-dozen more facilities around the world, according to the Astro Space Center's website. More radio telescopes on Earth could participate in future searches.